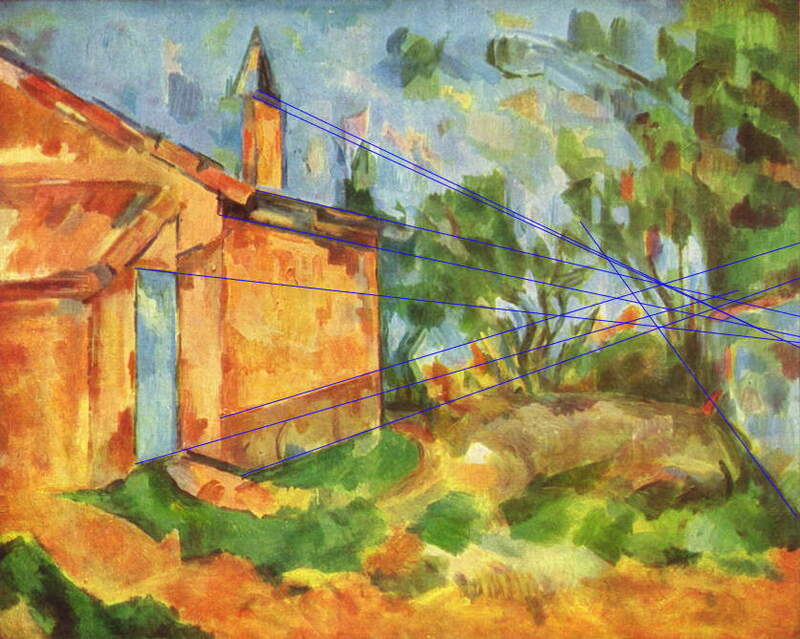 Paul Cézanne, Le Cabanon de Jourdan (Jourdan's Cabin) (projection marked) (1906), oil on canvas, 65 x 81 cm, Galleria Nazionale d'Arte Moderna, Rome. WikiArt. linear perspective and outline shape. 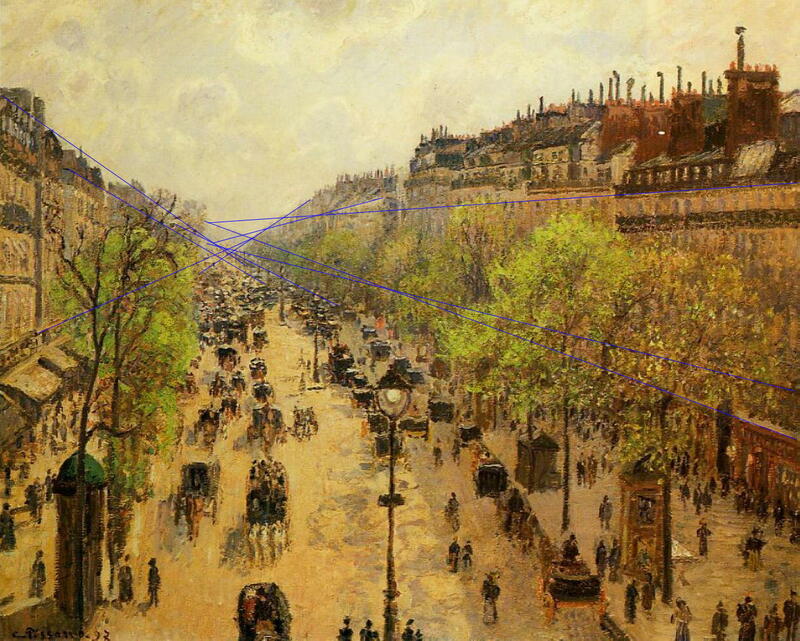 Linear perspective is one of the most controversial topics in the theory of painting, and few issues about it are generally agreed. Even its history is disputed: the standard account is that it was ‘discovered’ or ‘invented’ by the Italian Renaissance architect Filippo Brunelleschi in about 1420. However there are also various claims that Classical Roman painters used linear perspective as accurate as that of Brunelleschi. The truth is, as is often the case, somewhere between those two extremes. Yes, several Roman painters came very close to ‘discovering’ linear perspective as we know it today. However there is no known Roman painting which demonstrates accurate 1, 2 or 3 point linear perspective which is consistent throughout the painting. Careful geometric analyses of those paintings which look as if they are ‘correct’ shows that there are invariably multiple vanishing points, much like those of Renaissance paintings which had not quite reached the geometrical ‘perfection’ apparently demonstrated by Brunelleschi. I will not here reiterate the many other excellent and thorough accounts of linear perspective, but recommend that you study those listed below. My task here is to examine how important linear perspective is, and whether it is actually ‘correct’. If you are painting a motif which contains regular, linear, and particularly 3D cuboidal, objects, then in many cases it is important to get linear perspective correct at least as far as the viewer can see. Many viewers, probably through long training, have become quite adept at detecting visible departure from correct projection according to classical linear perspective, and will notice small deviations if your motif is line-rich. Alfred Sisley, The Church at Moret (projection marked) (1893), oil on canvas, 65 x 81 cm, Musée des Beaux-Arts, Rouen. WikiArt. However in most landscape subjects, and in other genres, perspective projection may be very hard to see, or may only be important in certain passages, such as foreshortened limbs. So long as those critical passages are correctly projected, you should be able to be fairly relaxed about the rest. However exaggerating or underplaying foreshortening is a common error (unless deliberate, of course), and careful measurement and formal projection will be worthwhile. Then when someone does try to claim that you got it wrong, you will be able to flourish your geometric construction and prove them wrong. Sometimes life is like that. That said, linear perspective projection is usually the least important of all the visual cues to depth and space in a painting, and should not be allowed to become dominant. The days when you could impress viewers just by a dazzling perspective projection ended with the Renaissance, I am afraid, and with the advent of sophisticated 3D modelling computer apps, such projections are ancient hat now. Is classical linear perspective correct? Rummage around with your favourite search engine and you will discover that there are alternative views, advocating isometric and other projections as being somehow ‘better’ or ‘more natural to the eye’ than classical projections. There can be no dispute that, in this world at least, the classical geometric approach to linear perspective, resulting in projections from 3D to 2D, is accurate. It is founded on classical or Euclidean geometry, which is known now not to be quite correct in some respects, but to all intents and purposes for painting remains quite accurate enough. But as I have been warning throughout this series (and my series on colour), our perception of the world deviates in many respects from the world as it physically is. Wagner’s book is long and complex, but one very clear message emerges: our perception of visual space is close to being Euclidean, i.e. matching the classical geometry of 3D to 2D projections, but is not quite so. One relatively simple test which you can do is to ask yourself whether converging parallel lines, from a fence or road, do actually meet at their vanishing point. Many observers would consider that, whilst they converge, they do not actually perceive them vanishing at a point. 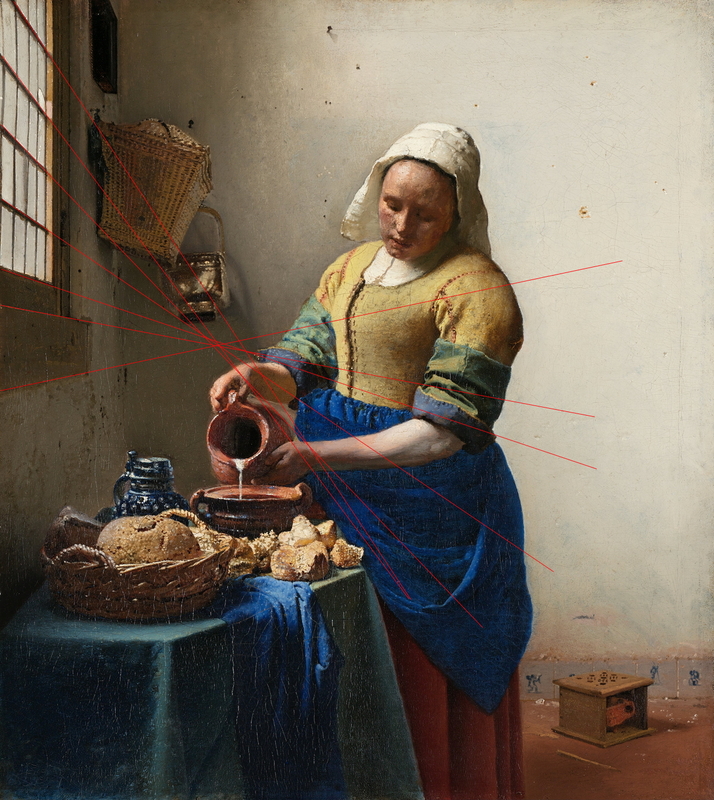 Johannes Vermeer, The Milkmaid (projection marked) (c 1658-1661), oil on canvas, 45.5 x 41 cm, The Rijksmuseum, Amsterdam. WikiArt. Despite many attempts to provide a more accurate model of the perception of visual space which could improve on classical geometry, none seems to pass tests of accuracy. Camille Pissarro, Boulevard Montmartre, Spring (projection marked) (1897), oil on canvas, 65 x 81 cm, Israel Museum, Jerusalem. WikiArt. In practice, I think that this leaves room for the painter to study the motif carefully and to depict it in their painting as they see it, provided that does not deviate too substantially from a faithful geometric projection. This is an excellent evidence-based case for painting what you see, and how you see it, rather than slavishly projecting with vanishing points, etc. Paul Cézanne, Le Cabanon de Jourdan (Jourdan’s Cabin) (1906), oil on canvas, 65 x 81 cm, Galleria Nazionale d’Arte Moderna, Rome. WikiArt. And amazingly even the high priest of nineteenth century anti-perspective, Paul Cézanne, seems to have done just that. Paul Cézanne, Le Cabanon de Jourdan (Jourdan’s Cabin) (projection marked) (1906), oil on canvas, 65 x 81 cm, Galleria Nazionale d’Arte Moderna, Rome. WikiArt. Bruce MacEvoy’s Handprint site gives what is probably the most thorough and detailed account of linear perspective for painting. Posted in Painting and tagged 2D, 3D, depth cues, depth order, linear perspective, painting, perception, perspective, projections, visual space. Bookmark the permalink.